There are three characteristics of a binomial experiment. There are only two possible outcomes, called “success” and “failure,” for each trial. The letter p denotes the probability of a success on one trial, and q denotes the probability of a failure on one trial. p + q = 1. The n trials are independent and are repeated using identical conditions. Because the n trials are independent, the outcome of one trial does not help in predicting the outcome of another trial. Another way of saying this is that for each individual trial, the probability, p, of a success and probability, q, of a failure remain the same. For example, randomly guessing at a true-false statistics question has only two outcomes. If a success is guessing correctly, then a failure is guessing incorrectly. Suppose Joe always guesses correctly on any statistics true-false question with probability p = 0.6. Then, q = 0.4. This means that for every true-false statistics question Joe answers, his probability of success (p = 0.6) and his probability of failure (q = 0.4) remain the same. The mean, μ, and variance, σ2, for the binomial probability distribution are μ = np and σ2 = npq. The standard deviation, σ, is then σ = . Any experiment that has characteristics two and three and where n = 1 is called a Bernoulli Trial (named after Jacob Bernoulli who, in the late 1600s, studied them extensively). A binomial experiment takes place when the number of successes is counted in one or more Bernoulli Trials. At ABC College, the withdrawal rate from an elementary physics course is 30% for any given term. This implies that, for any given term, 70% of the students stay in the class for the entire term. A “success” could be defined as an individual who withdrew. The random variable X = the number of students who withdraw from the randomly selected elementary physics class. Suppose you play a game that you can only either win or lose. The probability that you win any game is 55%, and the probability that you lose is 45%. Each game you play is independent. If you play the game 20 times, write the function that describes the probability that you win 15 of the 20 times. Here, if you define X as the number of wins, then X takes on the values 0, 1, 2, 3, …, 20. The probability of a success is p = 0.55. The probability of a failure is q = 0.45. The number of trials is n = 20. The probability question can be stated mathematically as P(x = 15). A fair coin is flipped 15 times. Each flip is independent. What is the probability of getting more than ten heads? Let X = the number of heads in 15 flips of the fair coin. X takes on the values 0, 1, 2, 3, …, 15. Since the coin is fair, p = 0.5 and q = 0.5. The number of trials is n = 15. State the probability question mathematically. d. What is a “failure,” in words? f. The words “at least” translate as what kind of inequality for the probability question P(x ____ 40). Read this as “X is a random variable with a binomial distribution.” The parameters are n and p; n = number of trials, p = probability of a success on each trial. if “number” is left out, the result is the binomial probability table. To calculate P(x ≤ value): binomcdf(n, p, number) if “number” is left out, the result is the cumulative binomial probability table. For this problem: After you are in 2nd DISTR, arrow down to binomcdf. Press ENTER. Enter 20,0.41,12). The result is P(x ≤ 12) = 0.9738. If you want to find P(x = 12), use the pdf (binompdf). If you want to find P(x > 12), use 1 – binomcdf(20,0.41,12). The y-axis contains the probability of x, where X = the number of workers who have only a high school diploma. The formula for the variance is σ2 = npq. The standard deviation is σ = . In the 2013 Jerry’s Artarama art supplies catalog, there are 560 pages. Eight of the pages feature signature artists. Suppose we randomly sample 100 pages. Let X = the number of pages that feature signature artists. According to a Gallup poll, 60% of American adults prefer saving over spending. Let X = the number of American adults out of a random sample of 50 who prefer saving to spending. The lifetime risk of developing pancreatic cancer is about one in 78 (1.28%). Suppose we randomly sample 200 people. Let X = the number of people who will develop pancreatic cancer. So P(x = 5) > P(x = 6); it is more likely that five people will develop cancer than six. During the 2013 regular NBA season, DeAndre Jordan of the Los Angeles Clippers had the highest field goal completion rate in the league. DeAndre scored with 61.3% of his shots. Suppose you choose a random sample of 80 shots made by DeAndre during the 2013 season. Let X = the number of shots that scored points. The following example illustrates a problem that is not binomial. It violates the condition of independence. ABC College has a student advisory committee made up of ten staff members and six students. The committee wishes to choose a chairperson and a recorder. What is the probability that the chairperson and recorder are both students? The names of all committee members are put into a box, and two names are drawn without replacement. The first name drawn determines the chairperson and the second name the recorder. There are two trials. However, the trials are not independent because the outcome of the first trial affects the outcome of the second trial. The probability of a student on the first draw is . The probability of a student on the second draw is , when the first draw selects a student. The probability is , when the first draw selects a staff member. The probability of drawing a student’s name changes for each of the trials and, therefore, violates the condition of independence. This is not binomial because the names are not replaced, which means the probability changes for each time a name is drawn. This violates the condition of independence. The outcomes of a binomial experiment fit a binomial probability distribution. The random variable X = the number of successes obtained in the n independent trials. The mean of X can be calculated using the formula μ = np, and the standard deviation is given by the formula σ = . The mean of X is μ = np. The standard deviation of X is σ = . What is the probability that at most five of the freshmen reply “yes”? What is the probability that at least two of the freshmen reply “yes”? X = the number of patients calling in claiming to have the flu, who actually have the flu. People visiting video rental stores often rent more than one DVD at a time. The probability distribution for DVD rentals per customer at Video To Go is given [link]. There is five-video limit per customer at this store, so nobody ever rents more than five DVDs. X = the number of students who will attend Tet. What is the probability that the San Jose Sharks win six games in that upcoming month? A student takes a ten-question true-false quiz, but did not study and randomly guesses each answer. Find the probability that the student passes the quiz with a grade of at least 70% of the questions correct. We are interested in AT LEAST 70% of ten questions correct. 70% of ten is seven. We want to find the probability that X is greater than or equal to seven. The event “at least seven” is the complement of “less than or equal to six”. A student takes a 32-question multiple-choice exam, but did not study and randomly guesses each answer. Each question has three possible choices for the answer. Find the probability that the student guesses more than 75% of the questions correctly. The probability of getting more than 75% of the 32 questions correct when randomly guessing is very small and practically zero. X = the number of college and universities that offer online offerings. P(x = 12) = 0.3186 P(x = 13) = 0.5882 More likely to get 13. Suppose that about 85% of graduating students attend their graduation. A group of 22 graduating students is randomly chosen. At The Fencing Center, 60% of the fencers use the foil as their main weapon. We randomly survey 25 fencers at The Fencing Center. We are interested in the number of fencers who do not use the foil as their main weapon. The probability that all 25 not use the foil is almost zero. Therefore, it would be very surprising. Approximately 8% of students at a local high school participate in after-school sports all four years of high school. A group of 60 seniors is randomly chosen. Of interest is the number who participated in after-school sports all four years of high school. X = the number of high school students who participate in after school sports all four years of high school. P(x = 4) = 0.1873, P(x = 5) = 0.1824. More likely to get four. The chance of an IRS audit for a tax return with over 25,000 in income is about 2% per year. We are interested in the expected number of audits a person with that income has in a 20-year period. Assume each year is independent. It has been estimated that only about 30% of California residents have adequate earthquake supplies. Suppose you randomly survey 11 California residents. We are interested in the number who have adequate earthquake supplies. X = the number of California residents who do have adequate earthquake supplies. There are two similar games played for Chinese New Year and Vietnamese New Year. In the Chinese version, fair dice with numbers 1, 2, 3, 4, 5, and 6 are used, along with a board with those numbers. In the Vietnamese version, fair dice with pictures of a gourd, fish, rooster, crab, crayfish, and deer are used. The board has those six objects on it, also. We will play with bets being 1. The player places a bet on a number or object. The “house” rolls three dice. If none of the dice show the number or object that was bet, the house keeps the 1 bet. If one of the dice shows the number or object bet (and the other two do not show it), the player gets back his or her 1 bet, plus 1 profit. If two of the dice show the number or object bet (and the third die does not show it), the player gets back his or her 1 bet, plus 2 profit. If all three dice show the number or object bet, the player gets back his or her 1 bet, plus 3 profit. Let X = number of matches and Y = profit per game. Multiply each Y value by the corresponding X probability from the PDF table. The answer is −0.0787. You lose about eight cents, on average, per game. The house has the advantage. According to The World Bank, only 9% of the population of Uganda had access to electricity as of 2009. Suppose we randomly sample 150 people in Uganda. Let X = the number of people who have access to electricity. The literacy rate for a nation measures the proportion of people age 15 and over that can read and write. The literacy rate in Afghanistan is 28.1%. Suppose you choose 15 people in Afghanistan at random. Let X = the number of people who are literate. It is more likely that four people are literate that three people are. There are only two possible outcomes, called “success” and, “failure,” for each trial. The letter p denotes the probability of a success on one trial, and q denotes the probability of a failure on one trial. There are only two possible outcomes called “success” and “failure” for each trial. The probability p of a success is the same for any trial (so the probability q = 1 − p of a failure is the same for any trial). 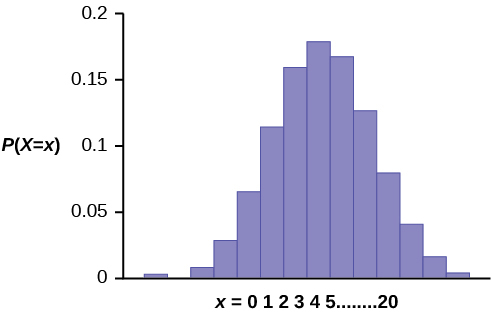 P(X = x) = pxqn − x.
Binomial Distribution by OpenStaxCollege is licensed under a Creative Commons Attribution 4.0 International License, except where otherwise noted.